Here’s an amusing stock photo captioned by the “It’s Like They Know Us” Tumblr Blog. I’m getting so much work done. Toddlers are easy. For those of you with computers and without small children, it’s funny because it’s not true. 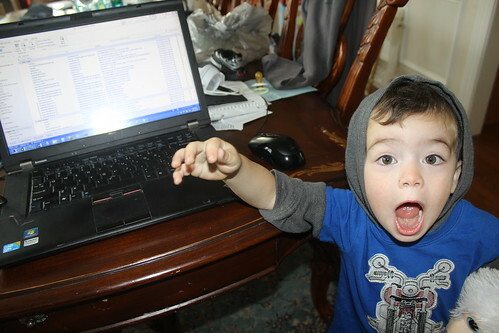 My children, in particular, have a keen sense of when I’m working on something really important on the computer. They will both drop everything and approach my machine, sticky fingers widespread. When I see them tettering my way, know what the first thing I do is? I quickly unplug my USB mouse. While they are distracted moving that around and doing futile clicks, I have just enough time to sign out of the production database server, save important documents, or move the laptop to a higher elevation. 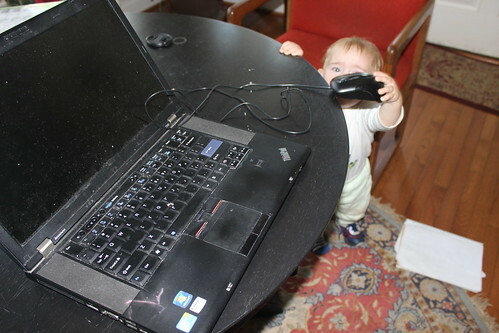 By the time they realize the mouse isn’t doing anything, the laptop (and all my production data!) are safe. I was enacting that one day and I realized I’m wasn’t particularly inventive. 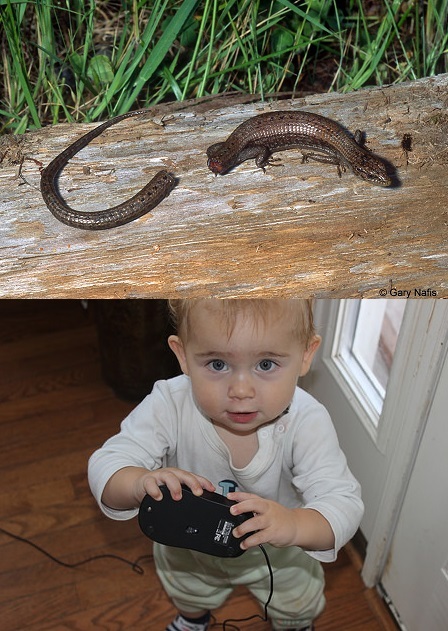 I was employing the exact same defense mechanism salamanders and seemingly other “lower” creatures have used for millions of years. Well Sagan isn’t especially communicative when he’s upset. He would just sort of zone out and sniff, occassionally wiping his nose against my shoulder. Really, I didn’t think he even noticed the song. Then one day, he bumped his knee and I had the nerve to switch it up a bit and sing Elvis instead. “Fussypants song.” he’ll croak out. I’ll carry him a few laps and sing our song. I have failed miserably at getting it on video, but Sagan has a stuffed monkey he occassionally plays with. 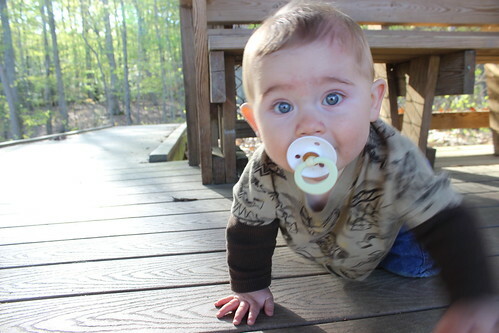 He does baby stuff with it– puts on diapers, feeds it, etc. On a few occassions, I have spied Sagan hugging it and singing the Fussypants Song. It’s super adoreable, but super elusive. Everytime I bring the camera out, the moment subsides. BUT– two weeks ago, I heard Sagan singing the Fussypants Song to Dyson and I did have success convincing Sagan to sing a few bars for the camera. Sagan’s version of the Fussypants song. Enjoy! Last week, I was working on a Washington Post crossword puzzle and a whole section stumped me. After revisting the clues again and again without any new insight, I surrendered and decided to Google on my phone. It was, in my mind, the act of defeat. The act of a loser. The very first clue I decided to Google was “Vanzetti’s Co-Defendant”. And just that like that I was enthralled. The rest of the evening, I found myself immersed in and fascinated by The Sacco and Vanzetti Trials of the 1920s, almost a century ago now. I read account after account until it was well past my bedtime. I read about the questionable aspects of their trials and conviction. I read about the world-wide protests, how renowed personalities such as Albert Einstein and H.G. Wells signed petitions urging another trial. I was surprised (and somewhat amused) at how generations before Johnnie Cochran and O.J. Simpson, there was another famous trial that prominently featured an article of clothing being too small. I never returned to my crossword that night. Days later, those boxes remain glaringly empty. But with a wealth of new information in my mind, I’m having a tough time feeling like I lost. My friend Meg is fighting cancer for a second time. 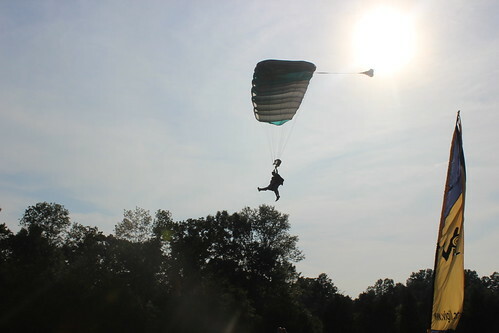 One of the long-standing items on her Bucket List was to go skydiving. 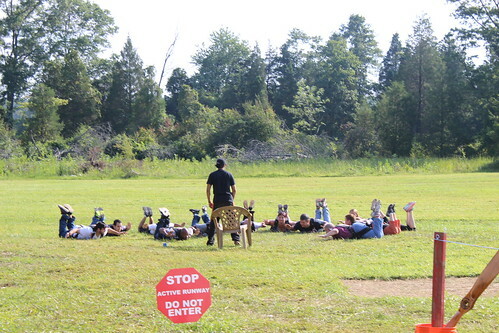 I absolutely did not want to jump out of a plane. No way. But you know what I can do? I can *pay* for someone else to jump out of a plane! (This was made even easier by a serendipitous Groupon). Meg’s longtime friend, Karen, also jumped. Meanwhile, Ryan, the kids, and I watched from the ground. 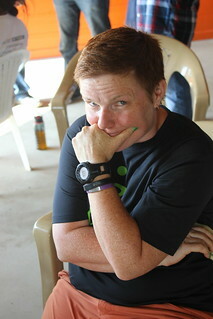 Meg was relaxed and at ease the whole time (She reports skydiving is no where near as scary as cancer). Karen, on the other hand, seemed to be a tad nervous. They were both equally ecstatic after the jump and concur it was thrilling and peaceful at the same time. I even heard the phrase “life-changing” when they would re-describe their experiences in the coming days. See also Meg’s recap from her CaringBridge site. As for the Sommas, even though we stayed put on the ground, the DC Skydiving Center was a fabulous adventure for the kids. In an intimate and disarming setting (so disarming I actually thought, “Huh, maybe I could do this too.”), we got to watch people learn their skydiving basics. 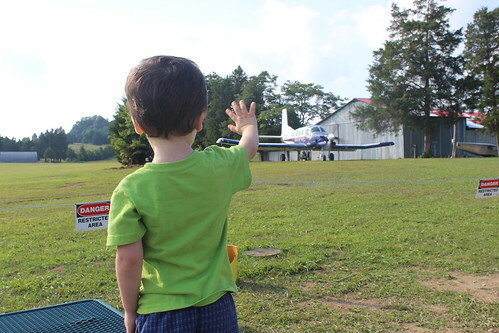 We were right there when the plane took off and landed which was a huge thrill for Sagan. We got to watch the sky for the tiny black dots after the plane passed by and we got to watch those dots get bigger and bigger. 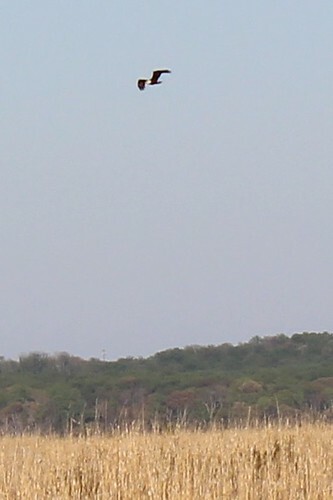 Eventually the skydivers would land right smack in front of us. And 1 year old Dyson? 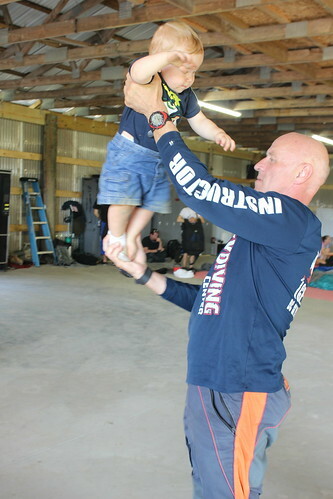 It turns out skydiving instructors can also make great playmates. If you think about, our family adventure that day was watching someone else’s adventure. But it was just as fun as our usual Sunday adventures… and more fulfilling. 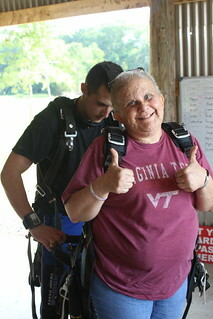 More photos of our visit to the DC Skydiving Center are on my Flickr site. P.S. Ryan’s already talking about taking the boys skydiving…when Dyson turns 18. 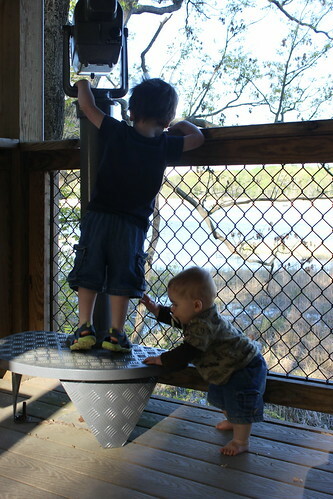 In late April, we took the boys to visit the Elizabeth Hartwell Mason Neck Wildlife Refuge Area. 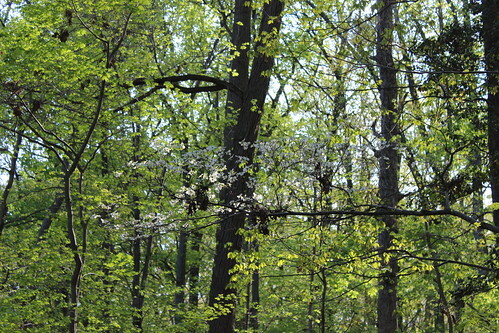 The Elizabeth Hartwell Mason Neck Wildlife Area encompasses 2000 acres of hardwood forests and six miles of Potomac River shoreline, which means hikes there get a nice mixture of marsh and forest. So “Woodmarsh” was an accurate name for the trail. 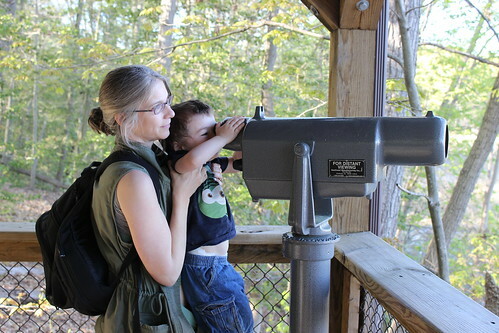 The Elizabeth Hartwell Mason Neck Wildlife Refuge is free. There is an entrance fee if you choose to drive to the nearby Mason Neck State Park afterwards. The Woodmarsh Trail is about three miles long. With a couple of cut-through trails at Hickory Pass and Fern Pass, you have the ability to “Choose Your Own Adventure” and loop back whenever you feel like it. We took the Spur Trail down to Eagle Point and since we were hoping to see Great Blue Heron nests (See Fauna below), we kept on the eastern most section of trail to skirt along the marsh. 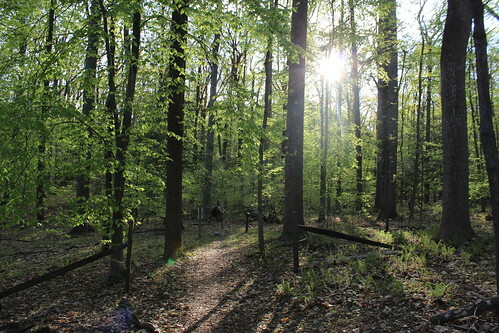 We returned via the western section of trail through the woods. The Elizabeth Hartwell Mason Neck Wildlife Refuge is one of the largest Blue Heron Rookeries. Nesting peaks in April and May, so we came hoping to see one of those 1300 Great Blue Heron nests. 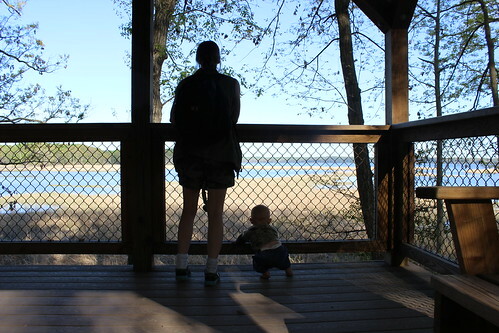 Alas, nesting views can only be approached through water or during the annual Bald Eagle Festival at the nearby Mason Neck State Park. We couldn’t see any nests from our vantage point on the land. Nonetheless, we saw our fair share of wildlife. 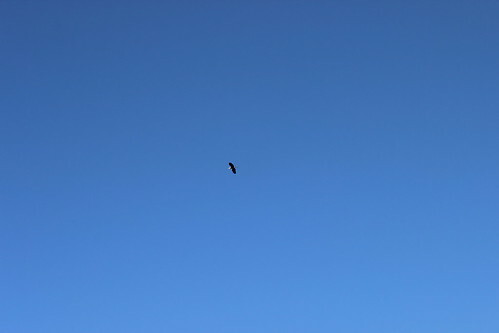 We saw herons and Bald Eagles flying by. We saw a large brown bird (perhaps an an owl) in the tree canopies. 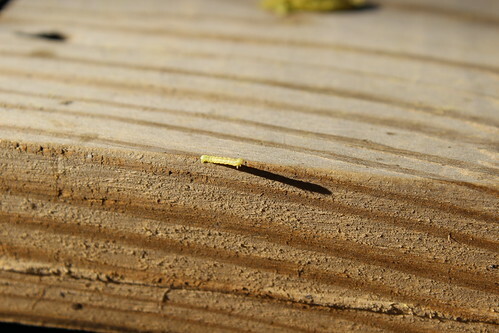 Small, but just as entertaining, we found an inch worm at the viewing platform at Eagle Point. Mayapples are a favorite wildflower of mine. I love how the big umbrella leaves conceal a tiny, single white flower underneath. 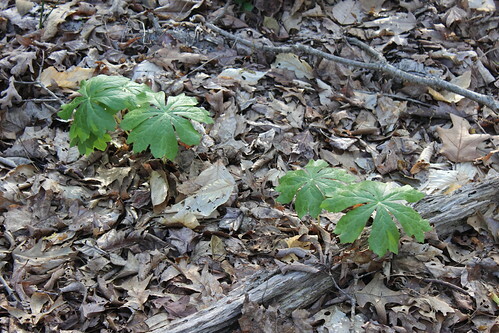 We saw Mayapples on this hike and they were budding, but we were just a little bit too early to see the blooms. What we did seem blooming was Virginia’s State Flower, the dogwood. The trail passed through a section called “Fern Pass.” Our assessment was that was aptly named. 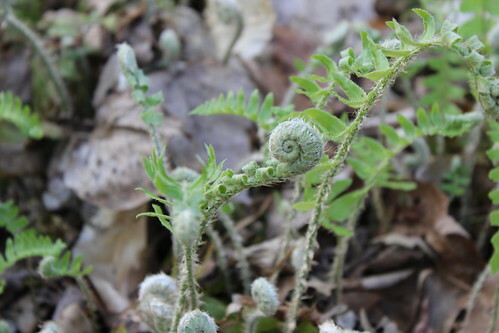 It was one of the more beautiful sections, carpetted in green, with the fiddleheads uncurling away. 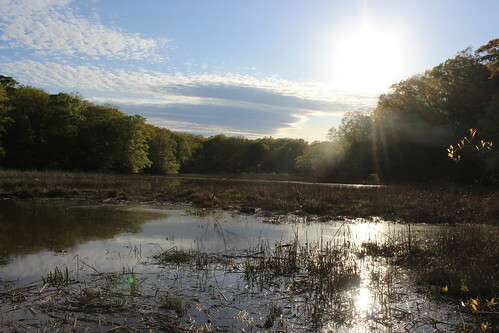 More pictures of our Woodmarsh Trail Hike at Elizabeth Hartwell Mason Neck Wildlife Refuge can be found on my Flickr site.